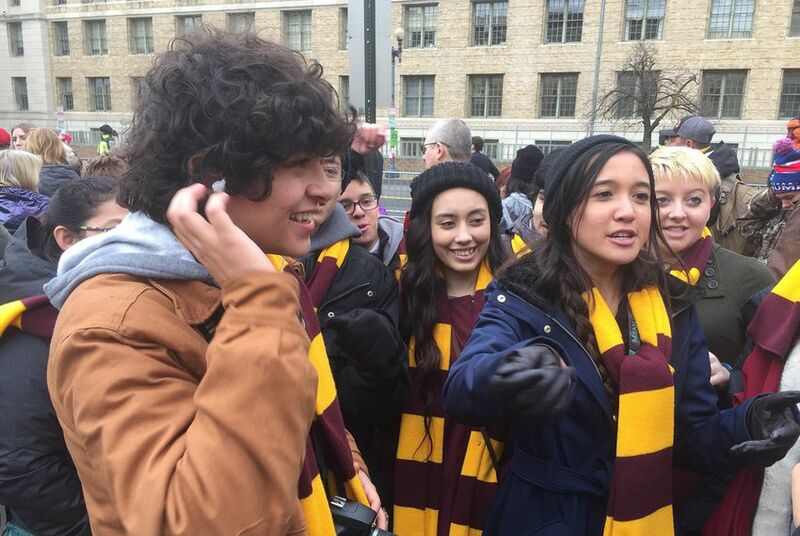 After spending a year raising money for the trip, a group of San Antonio students managed to look past any political disappointment to enjoy the experience of witnessing a peaceful transfer of power. WASHINGTON, D.C. – The scene around the swearing-in of Donald Trump as the country’s 45th president was cold, rainy and, even two months after the election, noticeably polarized. There were Make America Great Again hats, angry protestors, boycotts and even an occasional warning about eternal damnation. But not everyone at the National Mall was experiencing the moment overwhelmed with the partisan baggage of the last two decades. “I’m just excited to be here, just for the experience," said Jonathan Arreola, an 11th grader who said he would have voted for Hillary Clinton if he had been old enough to vote. Arreola was part of a group from the School of Science and Technology in San Antonio in town for the inauguration. Several of the other Texas students concurred with him: They probably would not have voted for Trump either. But there was not a whiff of political disgust among these kids. They were just flat excited to witness the peaceful transfer of power in person. Social studies teacher Mary Lutka began organizing the trip over a year ago, back when it was difficult for many to believe Trump had a shot at the presidency. She and her fellow teachers and the students raised money by soliciting donations, participating in rummage sales and selling candy, water bottles and crafts. Throughout the months of fundraising, Arreola, the 11th grader, said he always considered it a possibility that he would end up watching Trump sworn in on their big trip. In fact, it was the fundraising process that gave these kids – several of whom do not remember the George W. Bush administration — a keener political insight than many of the most informed political insiders. Martinez recalled the group's frequent weekend trips to nearby Helotes to sell their wares. Sarahi Rivas is a 15-year-old sophomore who dreams of being the first Latina president of the United States. She made and sold acrylic paintings to pay for her trip. She was a Bernie Sanders supporter during the Democratic primaries, but eventually rooted for Clinton in the general election. Eduardo Loo was a senior with the group, but he recently changed schools after moving to Pflugerville. Though he cast his first-ever ballot for Clinton last fall, he found the inauguration of the man who defeated her to be a great experience. Former Texas Gov. Rick Perry drew laughs in his Thursday confirmation hearing to be Secretary of Energy. Several Texas U.S. House Democrats opted to boycott the Trump inauguration. Texans celebrated Inauguration with a Thursday night ball in the outskirts of Washington.